A Downtown Sonoma Hotel in the Heart of Wine Country, where the locals send their friends. Relax in our comfortable rooms and enjoy our garden, pool and spa. El Pueblo Inn sits at the heart of Wine Country, flanked by lush fields of grapes and filled with an ambience that blends Tuscan beauty with Adobe serenity. 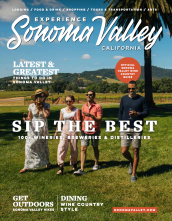 We're just a short drive from San Francisco, and from our door, day-trippers can enjoy excursions to the Sonoma Raceway, Jack London State Park, plaza wine tastings, shopping, eateries, and pastry shops. Relax in our interior garden or alongside our refreshing outdoor pool and hot tub, then set out to explore the scenic Wine Country.